Even as the Germans were closing down their Kursk offensive (Operation Citadel) on the Russian front in July 1943, the Soviets had already started their counter-offensive, driving into the shoulders of the Kursk bulge. The attacks into the Northern shoulder would see the liberation of Orel followed by Smolensk and the attacks into the southern sector captured first Belgorod and then Kharkov. This post delivers a mini-campaign, themed on part of the fighting in the north. Orel has just fallen and to the north west the Surovov Offensive opens with Smolensk as the ultimate objective. We are dealing with the first week of that offensive, where the Soviets tried to breakthrough in the direction of Yartzevo. 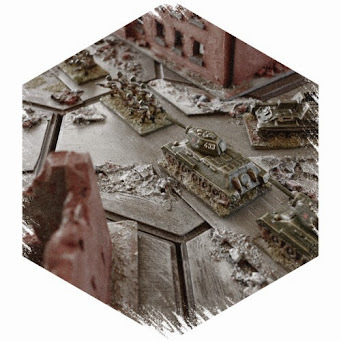 The campaign has been designed as a module to support my free Tigers at Minsk rules (see resources below) which manage a WWII tactical game, played out on a hex grid measuring just 8 hexes wide by 6 deep and fitting into a playing area no bigger than 3' x 2'. The module will probably convert quite easily to other rule sets and some boardgames. Those following the project will know that enough changes were made in the second full play test, that a further delay to allow another play test of the campaign was worthwhile. I am pleased to say that it all seems to be working as intended and I got some nice games and pivotal moments in my most recent run through the campaign. 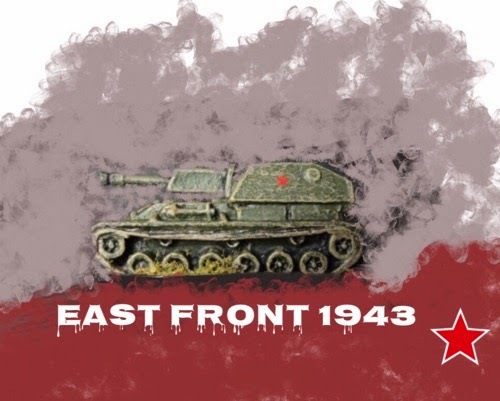 Gamers who don't have 1943 east front figures might still enjoy the campaign by either using a tactical boardgame system with different maps or boards being used in place of the Terrain Generator or if using figures, by just changing the units and terrain to suit their own collections. So for example the terrain around Yartzevo had plenty of forrest and marsh, swapping the environment to say Italy might see less marsh and more low hills or more rivers on the Terrain Generator Table. The Order of Battle can be changed simply by swapping like for like, so a T34/76d could perhaps be swapped out for a Sherman 75mm in a west front setting. This particular slice of action was chosen because despite the large forces available to the Soviets, they really struggled to make gains as the Germans were in well prepared positions and they launched repeated counter-attacks. The situation appears to give both sides a chance to become fully involved in influencing the developing situation, so that players are more willing to see the campaign through to a conclusion. The game is solitaire friendly. I will keep this post brief because the mini-campaign is a 13 page download available from link number one (below) and that will give the reader plenty of information and save repetition here. I will be running through the published campaign and posting some AAR's on this blog in the future. I hope you find something there that you enjoy. 6) A replay of a game during the second playtest. 7) A 14 page overview and design perspective of the second playtest. A lot of effort has gone into this and I enjoyed going along the journey with you. I am busy with a few different rules and so I am resting looking at yours as I know I will want to play them right away! The campaign engine looks fantastic (I have only looked briefly so I do not get sucked in) and definitely applicable to other rulesets. And it is for my favourite period on the East Front. Well done! Thanks Shaun, hopefully there is a little of something there for anyone interested. It has given me a renewed regard for the importance of play testing, as despite repeated games, there was always a consequence that presented itself that I had not addressed - as you no doubt appreciate from your developing rules. I have been following your 2' x 2' posts and it looks like your rules are pretty stable and doing what you wanted. thanks for this. I am really enjoying studying it and am getting ready to play it solitaire. Thanks, I hope that it gives you some interesting situations, it doesn't seem to have attracted much attention or comment, which is a shame considering how much work went into it, so I am really pleased that it interests you. Cheers Norm.